I greet you today in the Name of Jesus. He is so worthy to be praised and worshipped. He suffered in the flesh to bring power to the Word of God spoken over His life. Amen. Jeremiah 23:28 "The prophet who has a dream, let him tell a dream; And he who has My Word, let him speak My word faithfully. What is the chaff to the wheat, says the Lord." Father God in the Name of Jesus, I declare that I do have Your word within me and I ask You to help me to speak it faithfully to honor & glorify You. To be a help to those that You send to be helped. Those that desire to change by Your will. Lord let me be of service to Your wonderfully divine plan for us all. In the Name of Jesus I thank You for Your Love for us all-Yea Amen. The power of the resurrection is not just on Sunday-the day we recognize that He rose from the dead, and it does not end when people walk out of church, or when the sun goes down on Sunday evening. The full power of His resurrection is within the 40 days that He walked the earth continuing to do the work that He was put here to do before His Ascension to our Father--to our God. amen. Let us learn what we can from those that were not just "doing witnessing," but were "being a witness." Let us look at this strong, dedicated, determined woman named Mary Magdalene for a moment. She has many lessons to teach us from her life of faith. Aren't you impressed by the fact that Jesus returned to see that she was waiting for His return? I am. Out of all His friends that followed Him around for 3 years, the women were the ones that fully believed and trusted in His word. This made me remember how I have felt when the people I thought were my friends did not think enough about me to be there when I told them I would return. Let us imagine that, I may have been within a situation or within certian circumstances that took me down in a dark valley, and I knew that the only way out of this darkness-this trial, was to keep moving forward and to keep trusting in the Lord. I told my friends this and asked them to be with me as I am going through this. And if they could not walk with me (truth be told everyone cannot go with you), then to be there when I came back-came through this situation this circumstance that teaches me who I am. And lets say, only one was there waiting on me to return. Only one had the faith to trust and believe. That is how our Lord must have felt. Have you ever thought about this? Look at your life, do you see people that are not there-they could not go into the valleys with you but want you in theirs. Do as Jesus has done = Forgive them and pray that God will continue to work in them. Amen. His disciples forsook Him and fled, but the women that loved Him, were there in the last hours of His life as He hung on that cross for us all. 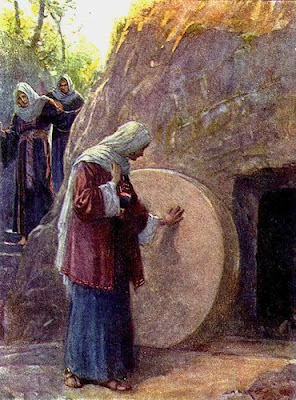 They were the first ones to be at His grave--it says in John chapter 20, "Now on the first day of the week, Mary Magdalene came to the tomb early, while it was still dark, and she saw..."
What did she seek so early in the morning? So this tells us that when you seek God early in the morning you will see Him. Just as He has told us in His word. Do As He tells us to do. These women would not, and could not leave Him and they continued to minister to His spirit and to His flesh with all of their substance. They remembered what He came to do for our Father God and all He had done for them (Luke 4:18). All that He was put here to do for us, they held it close and dear to their hearts and souls. He was seeding and watering their good ground. He nurtured the seeds that had been planted. They allowed Him to be the master gardener of their gardens. They had been His friends, bringing Him much comfort and strength in His life of strenuous service for others, and they were faithful to the end of His flesh life and were first to be there to witness His Spirit life begin. They were not just "doing witnessing" and stopped because Jesus did as He was told to do-- they were "Being Witnesses", all the way past His flesh life and death, through His resurrection and till He ascended up to the Father. They continued to do as they had been told by Him. We have to Be a witness, We have to Be love, We have to Be faith! Not just do it for a few days/weeks or a few moments of a day and think that is all that is required of us. As I have written and asked you in a previous post (What are you watering your garden with?) Who is your gardener? Are you allowing Him to water and use His miracle grow for your garden? 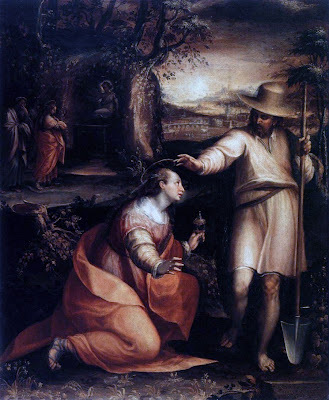 Jesus came back and appeared to be a gardener to Mary. His grave was in the midst of a garden. Even when the angel announced to her that Jesus had risen, it was like she was in shock, that her senses may have been numbed, the Good News did not register. She was with the rest of the disciples and heard Jesus say He would die, then would rise again in 3 days. But somehow they did not understand what He meant by this. All she knew was that His body was gone and she thought someone had stolen it. Her grief was being shed for Him. Then it happened, she turned around and she saw Him, but she thought He was a gardener and she begged Him to tell her where the body of Jesus was so she could retrieve it. Such devotion to Jesus did she have. Jesus spoke one word-her name "Mary!" And she immediately knew - for she said with uncontrollable joy, "Rabboni!" This was not an occasion for many words. There are spiritual experiences we come upon throughout our journey, that almost deprive us of the power to speak, and all we can do is, to wonder and adore Him. It was this way for Mary. Later on, Jesus appeared to the other women (Matt. 28:9-10), but Mary was the first to see Him alive forevermore! The love that He is spoke through His mouth that called her name--she knew that love to be only from God. This faith, this love that she was, enabled her to see the one wonder of all wonders from God. When Mary followed the commandment given to Her by Jesus, to go and tell the disciples the Glorious News that He Lives, she became the First Herald of The Resurrection-A WOMAN! What a privilege it was for God to bestow this miracle on her for our benefit! I see Mary as being an outstanding leader for all the women in her day and for us now. In order for her to be chosen to be the first to proclaim "He Is Risen! ", she must have been a woman of unblemished character and worthy of the honor from God. A man once wrote, "A woman is sent to be the Apostle to the Apostles." Within these 40 days is a wealth of wisdom, knowledge, understanding, growth, spiritual & natural maturity- a deeper more fulfilling relationship with Jesus--with God. Walk with Him in rememberance of what He has already done for us. Walk with Him, talking to Him everyday-He will never forget you, don't forget Him! With the Love of God do I speak over you right now, may you stay with God till we meet again-I know He Will stay with you!